My contract for the gladiator novel arrived in the post this morning. It looked very striaght forward. It is a long document but if you know anything about contracts, you simply follow the bouncing ball. Besides with Harlequin Mils and Boon, it is very much a take it or leave it contract. The funny part was that I had to deliver a copy of the manuscript on floppy or paper on or before 15 June 2005. As the date has already passed, I assume I fulfilled the requirement!! They have an option on my next work of a similair nature and /or my next work with major characters from this one. Not a problem. They will have 90 days to decide on what they want to do with the next one, so much less time than it took them to decide on GH. This is good! In the appendix there were bits about line edits for North America. Fingers crossed that this means it will be published in North America and it is not simply a standard clause. In any case, it is a wonderful feeling to be a contracted M&B author. As for publication, there was simply the standard wording of within thirty six months, so I expect I will find out in due course. The best place to get beekeeping equipment is Thorne (Beehives). They are one of the premier beekeeping suppliers in the world and are located in Linconshire. They also have all manner of candle making equipment as one of by product of bees is wax. And pound for pound, beeswax is more expensivethan honey. A bee hive consists of a stand, a floor, a brood box ( this is where the queen lays her eggs and is made up of approx 13 deep frames) a a crown board and a roof. When you are trying to collect honey, you add a queen excluder and supers (boxes filled with frames that are half the width of the brood box frames) The main reasons for keeping the queen out of the suppers are bees arevery reluclant to leave the brood nest, and successive hatching of bees means a build up exoskeltons, turning the frame wax black. You always have to take the impurioties out of beeswax and the wax from the honey cappings is the most higly rpized as it is nearly white. When honey is ready -- the bees put a wax cap on top of the honey in order to keep the honey in storgae. The harvesting of honey can be done in many ways. The simplest is through the use of a crown board and Porter bee escapes. The bee escapes are little plastic devices that allow the bees to exit the super but not re-enter. It the bees think the honey is inaccessible, they will try to move it to another place and can rapidly empty a super. The theory is: you put the Porter bee escapes in place, and leave the super to clear of bees. When you return, you pick up the super, put a cloth over it to keep out any interested bbes and take it off to some place which is a bee free zone to extract the honey. As it anything, if you have the right tools for the job -- honey extraction is pretty stright forward. We use a centrifugal force extractor as we only have (in theory) two hives. Larger commerical operations have electrical extractors. You first extract the honey, then you put the honey in a filter tank to get rid of most the impurities (like the odd dead bee) and then you can bottle the honey. Everything gets sticky, but it is satisfying and the children get rather sick on chewing beeswax cappings as they are still full of honey. Some people wash the cappingss and use the water to make mead. Other people feed the cappings back to the bees. The bees turn the cappings over and over, cleaning them of honey, and then after a few days, the beekeeper collects the cappings which can then be melted down. Beeswax smells wonderful. Swarms occur when a colony gets overcrowded. beekeepers spend a lot of time and energy trying to prevent swarms. As the loss of a swarm means less honey. There are many theories on how to prevent swarms, but really if the bees have made up their minds, they will swarm, they swarm. To capture a swarm (and it needs to be on your property/you must have permission of the property's owner/you must have seen the bees exit your hive) you need either a skep or a stout box or other device for catching swarms (Thornes have something that looks like a canvas bag attached to a pole. When bees first exit the hive in a swarm, they are fairly dolcile as they have engorged themselves with honey. After a few days, they are starving and so are less easy to handle. Bees have a nautral instinct to move upwards into a dark place as they naturally like to build hives in tree holes. When they first leave the hive, the swarm lights on a branch while scouts look for a suitable place to build a new hive. The beekeepers captures the hive either by knocking the bulk of the swarm in to the skep and placing the skep upside down a board on the ground below the tree with a slight tilt in the bottom to allow the bees to enter and exit. Or the beekeeper positions the skep over the swarm and hopes they will move up. In either case, the beekeeper then waits for dusk when the bees are clustered inside the skep. The beekeeper then moves the skep on top of the board (having made sure the bottom of the skep is now flush with the board to the empty hive. The beekeeper then raises the board to a 45 degree angle with the ground and the entrance to the hive, gives the skep a smart shake and the bees tumble out of the skep on to the board. The bees start to move upward into the new hive, sometimes assisted by the use of smoke. It is amazing to watch. I have decided that I have started editting way too much on my current wip. It is one of those -- I woote so it must be dreck type edits. I have not even finished transferring my paper scribblings from Lewis. For goodness sakes, I wrote some of it about a month ago. Okay -- it has expanded a bit,but even still. And my muse keeps wanting to leap frog ahead. What is the matter with me? Why don't I simply sit down and transfer this stuff? After I finish transferring it, there is a really good scene. I have even written bits of it. Then I do know what is going to happen next. So why do I keep messing about with editing? Why the work adviodence. Ah, yes. I look over my shoulder and there they are. My old firneds -- the crows of doubt. Did I say how much I dislike the crows of doubts, with their shiny black wings and insistent voices? Their beaks ready to tear into my fragile work? I suppose the only cure is to write. Over the weekend, we had another bee swarm. I took one super of honey off the large bee hive. It had to be done as the spare board was being used to help clear the super of bees. We got about 10 poundsworth of honey. I then recaptured the swarm. My dh was shouting instructions as he has managed to tear his Achilles tendon -- running, and so is now hobbling. The swarm was finally unceremonously plunked down in the weakest colony. I was stung for my pains. Roght on my thigh. Not pleasurable. But the bess appear to have settled in now. I have updated my website. Now hopefully the next time I need to make changes, I won't accidently move things to the master border. A quirk of net object fusion is that it automatically backs up every little change. Argh!!! Still I have redone it now. As I was asked by Michelle Willingham. The RNA stands for the Romantic Novelists Association and it is the equivalent of the US's RWA. However, founded in 1960, the RNA is the grandmother of them all. The founders read like a who's who of Romantic fiction of the time -- from Barbara Cartland to Alex Stuart to Elizabeth Goudge. Some founding members such as Anne Weale are still actively writing. Its main focus has been to promote and foster good professional writing in the field of commerical women's ficition. Its main emphasis has always been on the published novelist but the RNA does run an excellent scheme for the unpubbed in women's commericial fiction -- the New Writer's Scheme. Every probationary member is required to submit a book length typescript for evaluation. The script is read by a full member of the RNA, commented on, and if it is exceptional, it is sent for a second read and the RNA tries to help the writer find an editor or an agent. Sometimes with the revisions suggested by the RNA, the writer is able to improve the script enough and get it published on her own. (Although we do have a few male writers, most are female.) All manuscripts which have been through the scheme and are accepted for publication within the next year,are eligible for the New Writer's Award, Over the years, many successful authors have come through the scheme. Katie Fforde and Christina Jones spring to mind and who knows what the most recent crop will accomplish. It is highly respected in the industry among agents and editors alike. The number of New Writers is capped at 200. A figure that was reached very early this year. What does it offer the published writer? Through its meetings and its e-loop ROMNA , the RNA provides support for many UK writers. The market for novels in the UK is slightly different from the US and what the publishers are looking for can be different as well. It is a wonderfully supportive network. Many of its social meetings (ie the summer and winter parties) are used by agents and publishers to network. More can sometimes be learned in the loos at a meeting than one could learn from other sources. I know a number of writers who found their agent through contacts with the RNA. I know that I first learned about M&B Historicals desire to expand to other time periods from reading a report of a RNA meeting where a M&B editor spoke. The reason I sold my first book was that Kate Allan overheard someone in the loo speaking about how they had sold to DC Thomson and suggested -- I give it a go.Kate and I were able to use the knowledge we gleaned about Hale both from the RNA magazine and from the RNA conference last year to make a few changes to The Lady Soldier and in particular -- the synopsis. One other differeence is its conferences are much smaller and therefore much less formal than the RWA. There are no editor or agent appointments but it is possible to speak to editors and agents directly if they are there. They do welcome vistiors from overseas, and so it can be a way for US writers to travel to the UK for business purposes. I am a huge supporter of the RNA and am pleased that the Association has decided to raise its profile, partly throug hthe help of its sponsor for the Major Award --Foster Grant. If anyone is reading this and is not a member of the RNA and lives in the UK and would like to become a reader, the RNA website has an application form for Readers. Readers will be required to read five books in six weeks and comment on them. They should be familiar with women's commerical fiction and in particular romance. Yesterday, I did the trek up to Alnwick for the RNA Northumberland meeting. One nice thing is that my car is full. This time I had Anna Lucia on a navigator duties, Gwen Kirkwood, Prue Philipson and a new member Shirley Dickinson in the back. It made for lively writerly discussion which is a change from the folk music I would have had on otherwise. As usual the meeting was motivating. Peg Gardner who used to write for M&B years ago brought one of her revision letters from her old editor. It is no wonder that her ex editor went on to become a celebrity agent type. He had a wonderful eye. There again MY editor at M&B has a wonderful eye and sets things out much the same, giving page numbers where things are not really working. Peg also did a mini workshop on symbolism and using symbols in your work. That reminded me of the Donald Maass exercise about symbols. It is all about making objects recur, gather meaning and then releasing them. It made me think about the objects Kate and I used in The Lady Soldier (most obviously the watch and the bell) and the objects I used in the Gladiator's Honour (the wooden sword, the figurine and the brooch). It is now a matter of weaving in, making sure certain objects recur in TSD... So yes, I know my symbolism is there at the end, but sometimes I wonder if I am a deep enough writer. Other writers I know such as Julie Cohen do symbolism much easier. Anyway, what about you -- as a writer do you put symbols in? As a reader do you look for them? Is it best if you don't notice them unless you are actively thinking about them? Rakehell has done a review of The Lady Soldier. The reviewer has a weakness for chicks in pants type of stories and did like this one. So that is pleasing. As many of you may know the RNA runs the highly respected New Writer's Scheme. My experience with it was mixed. Some of it was my own fault. I submitted a partial and got some feedback, including the fact that the reader thought I was publishible. She also thought that M&B would never publish a Roman set romance. Last year, of course, I had sold to MWSC and so did not submit. However, I did become eligible to read for the NWS. I volunteered to do so in January and last week I received my first manuscript. Although the manuscript had problems, the writer oozed with potential. I do so hope she continues to write and to submit to publishers. Anyway, I wrote an 8 page report. I know the guidelines suggest 2/3 pages but hey people are paying cold hard cash and genuinely want some sort of direction. I divided the report in to four parts -- current market as appropriate to that manuscript, suggestions for futher reading, craft problems and then finally plot problems as I saw them. Then I signed it and sent it off. The woman wrote to Nicola Cornick to thank her as she could not read my scrawled signature. She had expected to be gutted by getting her script BUT in fact had found her hands itching to get back to the keyboard. That made my day! Fingers crossed that I have given her enough info to enable her to lift her writing to the next level and get published. I am afraid that I am horribly competitive about these things. I want the people whose manuscripts I read to become published! reflected glory and all that. This morning was an admin morning. The bookplates arrived from Kate A, so I stuck them down and now the books won in the Romance Junkies contest are waiting to be posted, along with the NWS report I did, the art from for my editor and the bookplates other people requested. My canvas satchel is almost overflowing. So nothing thus far this morning has been accomplish on my wip. Argh!!! Still I have had good thoughts about the wip and that is a positive. Given the distractions one gets as a published author, I think it is imperative that one develops good work habits as an unpubbed. Unfortunately, one of the side effects of waiting to hear from an editor is that you tend to goof off -- find excuses to check email or e-loops. Over the past year, I have fallen into bad ways. Thus my system is getting a short sharp shock. If I wan to accomplish all the writing that I need to this year -- there is only one thing I can do -- write! It is that simple. The heat has cooled a bit and we have had some rain. But hopefully we will get some sort of summer. The JDP is sitting on the lawn. JDP is now the name for the ducklings aka Junior Duck Patrol. I have decided that ducks are creatures of habit. The first night, they were put in the duck house after being allowed out, 3 ducklings went to the right instead of going straight in. Now thosethree always go the same way. I must write but have finished my minor revisions. The bad habits I developed whlie waiting for the response of the gladiaotr one are starting to catch up on me. As my dh keeps pointing out -- this is real now. This is business. But I do think I am making progress. I did my RJ chat and everyone was so nice but it was exhausting. I never knew what might pop in the inbox next and then I wanted to say something different to everyone -- plus trying to sound witty, profound and not misspelling/mistyping words as is my wont. I am hoping some people I actually know from other boards win TLS but there again, I assume that most peple who entered want to read it. I also had a brilliant email from my editor and she phoned as well. Unlike Hale, HM&B do seem to keep in touch. Although it is nice to have something in writing now for when the crows of doubt start to perch on my shoulder. I have a list of revision points that I have to do by the 27th. They look easy enough.You'd have thought that I'd have remembered that people can't hiss words if there is no s.
I also have to fill out an art form -- old version. The NEXT book I get to use the computer HERS system. And I tried to figure out how many free books I would need -- extra. to the 12 they give you. I do want to run a few contests and Dorine at RJ has helpfully said that she will arrange a book review. Yesterday, these arrived from my mother and sister as they are very proud of my achievements and wanted to do something to celebrate. They both know how much I love flowers and so sent me a bunch. I was surprised and delighted. The bouquet came very tastefully wrapped in purple and tied with a raffia tie. 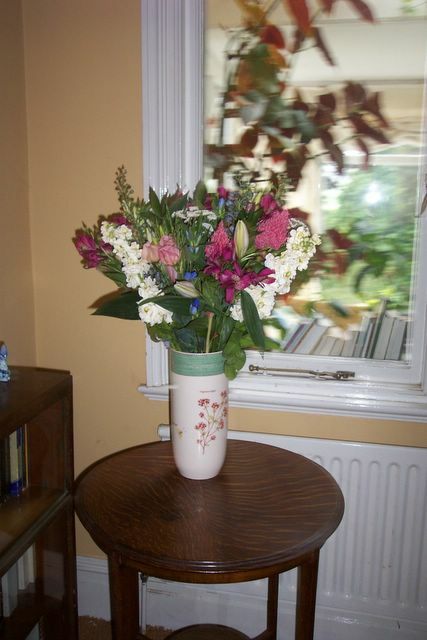 It contains all manner of flowers -- l;ilies, delphiniums, phlox and a number of others. I thought -- brilliant. 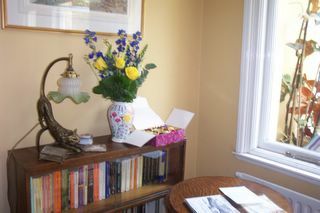 It is another absolutely goregous bouquet and someone knew my weakness for chocolate. But who? There is no note and despite my pleading to a very lovely at Tesco, she refused to divulge the name of the sender. It was a random act of kindness. And what a wnderful act it is. I really appreciate it. So this is to say thank you to whoever sent it. I know, btw that it was not my husband because he refuses to use the internet. Anyway it really made my day. I had a pleasant surprise today. I did my daily check of The Lady Soldier on Amazon and a review was posted there. It was really unexpected. Someone who attended Kate Allan's launch party had pruchased a copy of the book -- not really intending on reading it but he had forgotten his newspaper and began to read the book on the tube on the way home. he stayed up until 3am, reading it!! It is so great that someone enjoyed the book enough to write a review. It means a lot to me and I am sure to Kate.But for someone who was essentially doing a favour (and buying the book because Kate is attractive) and is not a natural reader of such books to stay up that late because he found it a page turner is absolutely thrilling news!!! I am so pleased he enjoyed it. I had come to the conclusion that M&B only made sale calls on Tuesdays or Thursdays. Thus when Friday morning rolled around, I thought -- I won't hear this weekend unless of course it does not work for them. I went about my business. Went into Hexham and saw the bookseller, Cogito Books, about The Lady Soldier. Much to my surprise, he has been able to order copies and is quite willing to have me do a talk. I find out on Monday the topic. I have suggested --researching the Regency. Then I came home to a message from Hale. They think The Lady Soldier has legs and are going to reprint straight away. This is good news as Kate and I have a number of publicity events planned and were frantically counting books. We should now have enough books -- fingers crossed. We sent a long list of the planned events as well as the reviews and articles which are in the pipeline. Anyway this seemed to do the trick. We find out next week the actual publication date of the second printing. The telephone rang and I raced my daughter to answer it. There was this lovely voice on the other end -- This is Linda Fildew from Mills and Boon. My one thought was that she was calling to discuss a few points. Maybe I was really close. After all they never CALL on Friday. Her next words showed me how wrong I was. She said that they wanted to buy The Gladiator's Honour. She was calling me on a Friday afternoon so I could have a wonderful weekend. I started crying. Linda said that it was one of the nicest parts about being editor -- calling someone who was so happy and excited about the project. The book had made her feel as it she had actually stepped into the Roman Arena. She then said that there a few very minor points -- page 309 was missing (how did I not notice?) and I had a loose end I needed to tie up. Very easily solved -- we discussed the solution.Also in the first version I had included a bibliography but not in my revised version. Could I put it back please? The answer is obviously yes. For Roman historicals, they are going more mainstream and want readers to be able to do further reading if they want because the time period is not as well known in many ways as say the Regency. Luckily this is not a problem as I own copies of all the books I mentioned. (I am also going to put their names on my website). We also discussed revisions. She told me that what they wanted was someone they could work with. Someone who take their basic ideas and make them their own. Sometimes new authors were terribly precious about their words and others they simply followed the idea slavishly so that the work no longer read like their own. An editor is a midwife. Then we talked about Mills and Boon and I had to explain about how I haunt e-harlequin and how I had met Bryony Green last year at the RNA conference -- even ending up having lunch with her. I also explained about the Mouse and Pen as well as all my friends from the RNA who had helped me. Finally we ended the conversation and I went to find my husband who my eldest informed had gone for a run. My eldest also looked up from the tv and asked what was wrong. I explained that I had just sold a book. Luckily my husband had not left and I was able to tell him as well. Then I started telling everyone I know. And the wonderful response from people has been overwhelming and truly touching.Writers communities like e-harlequin or ROMNA or the other loops I belong on mean so much. Writers are truly the only ones who understand. Anyway it is all tremendously exciting andI am thrilled to have this opportunity because I really do believe Rome is a great backdrop for Romance. It came to me yesterday that part of ch 4's problem was that too much was in the heroine's pov. The reader needed to know more about the hero and his motivation/conflict. I spent the morning switching it around and it now reads better. At the moment, I seem to be enamoured of dark. His dark curly hair, dark circles under his eyes, dark thoughts. This is not good. It is getting way to see any half way decent writing. Dark hair has to be described a different way and thus allow me to bring the reader more into the heroine's thoughts. What would she think of when she saw dark hair -- charcoal, raven's wing or black stones on the edge of a pool shimmering. Deciding how a character would describe a scene is one of the more interesting parts of writing. What is important to them and why would they notice a specfic feature. The way a room looks to someone can often tell you about their mood, character and general state of mind. Snow for instnace can be suffocating but it can also be fun. It can treacherous hiding dark secrets, or it can make an ugly landscape become reborn. Snow can mean survival but it can also mean a chance for play. What your character brings to the scene helps determine what sort of snow it will be. It is the character's reaction that is important rather than the actual snow. Anyway, I think the changes I have made have helped to make the story stronger as the individual personality stamp was missing. Hopefully it is now there. In other news: the ducklings now look like they have punk hairdos and their wings are in pin. Sometimes, one of them stretches her wings and she bears more of a reseblance to a cormorant or a shag than a duck with ragged short wings. Each also is developing a green sheen to their feathers. They are becoming quite pretty little things. (Yes, I know I shall have to do some more pictures) I have been rather worried about them suddenly developing primaries and flying away, but my husband assures me that there is no need to clip their wings until the autumn. Help I have been tagged by Kate Hardy and therefore get to play the meme game. I deleted the first name and put my name at the bottom. 1. drying apricots from our apricot trees -- first picking them, then cutting them in half and laying them on trays at the drying place. Then when they were ready collecting them, washing the sulphur off and eating them.Far sweeter than anything I could get in the shops. 2. reading Nancy Drew and the Hardy Boys. 5. going to the drive in movies and having blankets etc in the back and the sound being dreadful. I discovered today that there were less than 50 copies of The Lady Soldier left in the warehouse. Gulp. I had not expected them to go THAT quickly. Kate Allan and I have been doing quick checks to make sure that there will enough available for a variety of events. We think we have convinced the publishers to do a reprint rather soonish as Kate is going to appear at the Jane Austen Fair at the end of August. Apparently, the Jane Austen Fair attracts thousands of people and she needs to be there with stock to sell. Hopefully as the new movie will be coming out, it will be even more crowded than usual and lots of people will buy our book. Also, the bookseller who promised to stock The Lady Soldier in Hexham has not yet done so. He has now promised to do so and to possibly arrange a Saturday morning signing. I explained that I did not want to get a piece in the Hexham Courant until I knew he had books. I also explained about the reviews in The Northern Echo and the two different re-enactment magazines. In addition, I handed him a copy of the Newcastle Journal Culture magazine with the article about the RNA Northumberland in it. At his last signing plus talk, the author sold 25 books. He also does Evening with authors. The Anne Fine one was a sell out -- 60 people paid for a talk and a dinner with her. I am not in that league. But it would be pleasant to sell a few copies. After all I am a local author. On 14-16 June, Kate and I will be appearing on the Romance Junkies website-- talking about The Lady Soldier etc. So hopefully that will generate more interest. Yesterday, we were contacted by Great Writing, a new website dedicated to writing and are doing an interview. Again links with Amazon are promised. It is all rather exciting but rather nerve wracking, particularly if the publisher is not quick on their feet and we end up doing publicity but no books! As Kate discovered back in April, it is much easier to sell books at fairs if you actually have the stock on hand. On the positive side, a reprint means the first print run books are potentially much more valuable. It is the books which have all the print numbers on the copyright page from 1 to 10 that are the ones collectors want. And of course we have made our advance -- always good news. Muses are funny creatures. You think you have figured them out and know how they operate. Then they decide to give you a wild pitch. I spent most of yesterday obsessing about the hero's name. I was convinced that was what was wrong. Then it came to me as I was climbing down the ladder after an impromptu cleaning of the gutter under the middle's window. (The children now know that to tease by holding books out a dormer window -- several things will happen if you accidentally drop them -- 1. They will slide down the roof. 2. They will become stuck in the gutter 3. Their mother will become rather angry). I need to make his motivation for a few things clearer. So this morning I went back to chapter 3 and layered a few things -- hopefully adding to the conflict. Suddenly the muse is happy. She does like the name Octavian and now does not want to change it. Why couldn't she have whispered her problem in the first place? 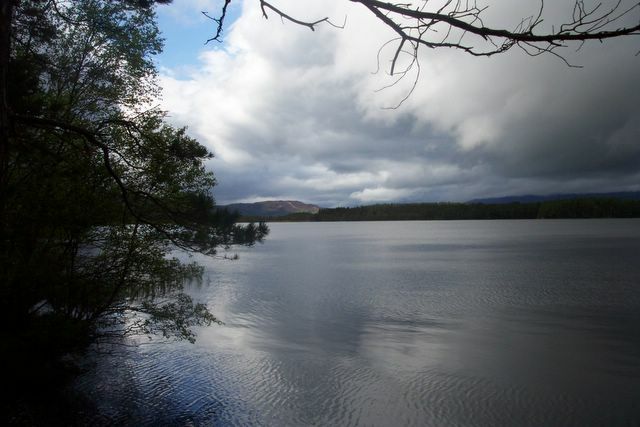 Kate Hardy made mention of Vindoland in her blog. And that reminded me. Apparently this year's dig has revealled a horde of statues and busts. They are all very excited about the development. My husband was speaking with someone who works there at a governor's meeting the other week and he was explaining about this. The High School where my eldest goes has ties with Vindolanda that go back many years. This means I shall have to go and visit once again. Vindolanda is quite near my house (within hiking distance) and it is where they have discovered more private Roman writing than anywhere else. Much has been preserved due to the soil conditions. The British Museum recently said that the Vindolanda tablets were the greatest of all their treasures. Every summer, the Vindolanda team excavates more of the site. Some of the best finds have come from the areas of the old latrines. We let the ducklings out of the pen today. For a moment, the ducks looked at the open door and just sat there, preeening. Then Clive decided -- freedom and started the mad scramble. The ducklings are big enough now that unless the bird of prey were an eagle, I don't think they would be in danger. They have nearly all their feathers except for the dark brown down that covers their heads. Each white bib is slightly different -- with a different sort of pattern of brown against white as if they spilt something. Only one is pure white and another chocolate brown. Their quack is different -- less peeping and more grown up duck like. There are still six and as near as I can tell, they are female ducks. Drakes seem to have curly tails and none of the ducklings' tail feathers show the slightest interest in curling at the moment. The crunch came last night when I decided the pen was fast becoming a health hazard. I also took a look at the garden and realized that we had had an explosion of certain types of weeds -- dandelions and this sticky green stuff. I had not seen the sticky stuff in any quanitiy for years so the ducks must have been happily munching away at it. In any case, they seem very pleased to be out of their confinement. Much quacking and wagging of tail feathers. In other news: Kate Allan had her launch party for The Lady Soldier last night. It was well attended. And she has run out of book plates as I have done. When I made up the first batch, I had thought -- oh it will take forever to get rid of them and I don't want to be cocky here, but so far people seem to want the bookplates... Each bookplate is signed by both of us and numbered. So it is a matter of running off some more. On the whole, everything seems to be going okay with The Lady Soldier. Next week on 14-16 June, Kate and I will be appearing on Romance Junkies' Book club to discuss the book. There is a chance for 3 NA based people to win a copy. Hopefully, people will stop by. 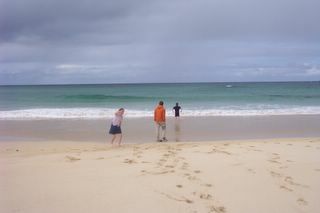 The following pictures are of our trip to Lewis. I had little idea of what to expect as I had never visted a Scottish island. Indeed it had been 20 years since I had been in the Highlands. Lewis and its other half --Harris are both wonderfully untouristed. The skys are large, and the scenary rugged and unspoilt. Most of the roads are single tracked and you rarely see another car. But if you do, there are passing places. Stornoway is the main town and boasts of two supermarkets. It also has a fantastic butchers -- Charles MacLeod which produces some of the finest black pudding I have ever tasted. They also do a delicious hot smoked salmon. 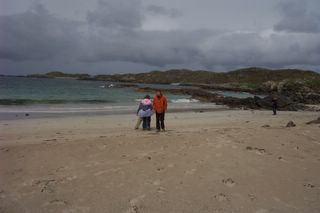 We went self catering on Lewis and thus did not try any of the restaurants. There are very few restaurants but I understand from comments left in the house's vistiors book, the seafood is excellent. Also excellent is the price for Harris tweed. As you may know Harris Tweed is still woven in cottages on the island. At the Lewis Loom Centre, there are an excellent selection of cloth. My husband purchased enough to have two suits made. We also bought sweaters from the Isle of Harris Knitware. All sweaters were handmade by people on the island. We purchased machine knit rather than hand knit. Each sweater takes about a day to make. The money helps support the women on the island. The sweaters are made to last and are wonderfully warm. Mine is heather purple with a Celtic knot pattern across the front. The wool is the same wool they use for making Harris tweed. 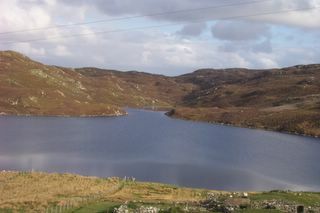 For anyone looking for a quiet holiday in an unspoilt area of Britain, you could do a lot worse than looking at Lewis. On the Sunday, the weather cleared and we drove out to Bernera, a small island connected to Lewis by a bridge across the Atlantic. At the tip of the island is Bosta beach. In the early 1990s after a storm, a series of iron age houses were revealed, having been buriend in the sand. We collected shells and my husband watched for birds as Golden Eagles nest there. We did not see them on that occassion but did see them the next day from the house which did have a view over Bosta. 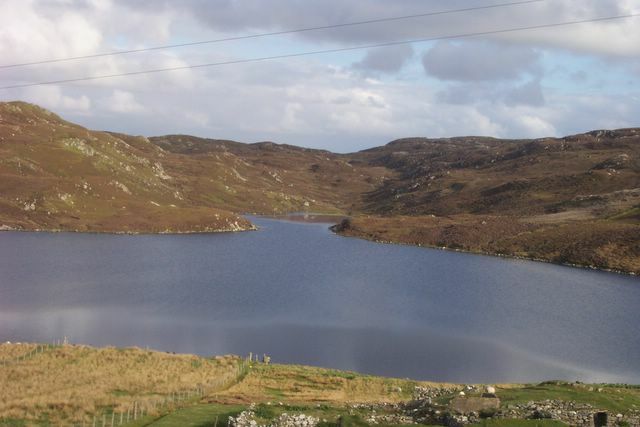 These stones are made of Lewisian Gneiss, a type of white granite and one of the oldest stones in the British Isles. 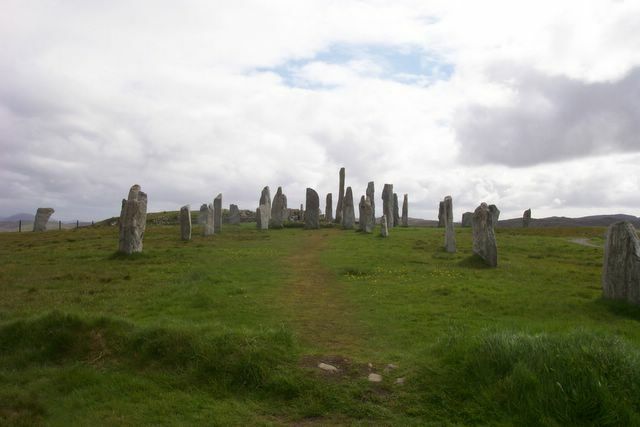 It is one of the most complete stone circles and is in the shape of a Celtic cross. This is somewhat intriguing as the stones predate the Eygptians. The shape and the cairn in the centre have caused some to speculate about aliens etc. However, the most likely use would be a calender. There are several smaller circles nearby. We went on a Sunday so the visitor centre was closed but we were still able to walk up to the stones. Everything is closed on the Sabbath on Lewis. 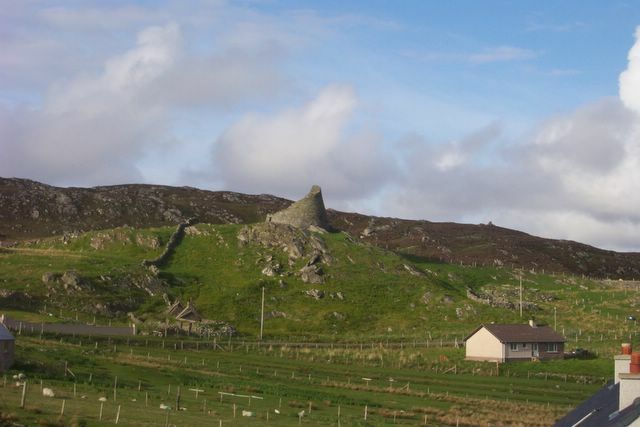 We stayed at 7 Doune Carloway which was out on a point and gave us the most marvelous view of the Carloway Broch. A broch is a 1st century AD dry stone wall tower. This is one of the best preserved in the world. They had several floors and served as protection as well as a status symbol for the builders. It is possible to go into the broch and get an idea of what life must have been like. It made for a dramatic backdrop for the house. The house was three bedrooms with a lounge, well equppied kitchen and a bathroom. It was wonderfully warm and cosy when the wind howled around. Before we went to Lewis, we spend the night at Carrour House Hotel in Aviemore. Robert and Carol Still gave a wonderfully warm welcome and the house is a beautifully decorated late Victorian dower house. The food was well prepared and more than ample. The Scottish breakfast included sausage, bacon, black pudding, as well as eggs, fried bread, mushroooms and tomatoes. We did not eat again until we arrived in Lewis that evening. On the way to the ferry, we stopped at Culloden. A bloody stupid ground to fight on, chosen by a fool. It is no wonder the Jacobites lost to the Government forces. However, what happened afterward was enough to turn one's stomach.Did the government really need to burn men alive in a barn? Or bayonet innocent bystanders including a nine year old boy? The crossing was a rough one. People were sick all around us, but luckily none of us were. We were very pleased to reach the house and find a warm welcome. 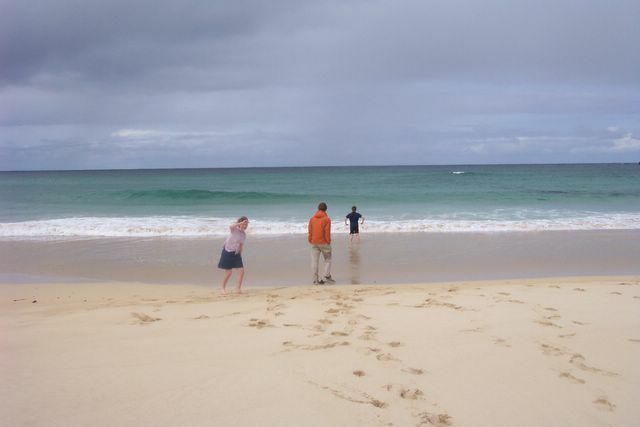 This is Uig Beach where the Lewis Chessmen were found. The sand is very white and tends to blow and I can see why the chessmen were lost in the first place. It is the most remote part of the island and a good place to go if you want to drop out of the world. The white sand and crystal blue water would not go amiss anywhere. The colour of the water was as blue as any that I have seen. For sheer spectacular beaches, you could do a lot worse. These are reconstructed black houses on Lewis. Dozens of ruined and abandoned black houses dot the landscape. They were abandoned in the 1970s (and before) when the government built council houses for the crofters. The main fuel on the island was peat and this smokes badly -- thus giving them a blackened appearance. Even today, it is possible to see piles of peat that crofters have dug up and are drying for fuel. The land was basically farmed in a medieval strip fashion so that the plots go back from the sea and all crofters had a mixture of the fertile machair (pasture over sand), kelp beds and the rough heather. 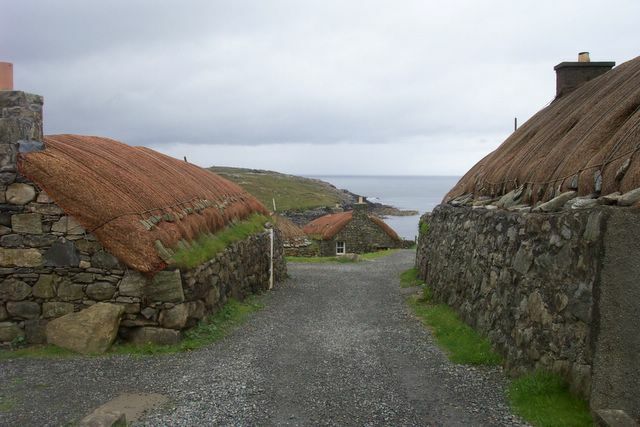 The blackhouses are starting to be done up as holiday homes but they are very small with at most one or two rooms. These houses are used as a museum as well as a youth hostel. This is the view from the kitchen window of the house we rented on Lewis. On the last day, the children asked if they could down to the loch and were told -- yes, if they went as far as the bridge. They decided to go for a hike around the loch. Luckily my husband and I once we had discoverd this fact, were able to keep tabs on their progress through binoculars. The middle decided to do this in her sandals and a skirt. A mistake that I don't think she will be repeating. I am back from Scotland and will blog about my trip later as I am sure someone wants to live vicariously. But I want to put photos with it and my camera started acting up...Advice to self -- never let husband carry said camera when he starts off for a short hike with the boys...Lewis is another world. I came back to No News. Nothing. No letters or emails about my mss with publishers or agents. Massive relief as it means everything is still there and still has a chance. However, I did find out that The Lady Soldier had sold 254 copies on pre-orders. That means it has already made its advance back and at some point I will get a royalty check. Also the cover appears on the Historical Novelist Society site. So I am very pleased and proud it is all going well with The Lady Soldier. Now I have to sign up for Public Lending Right. You can not submit the forms until after publication.